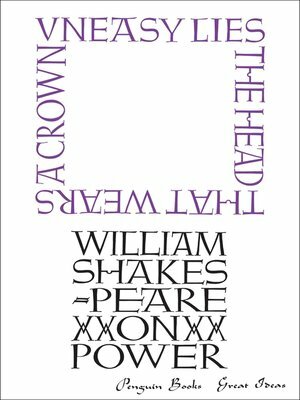 These are Shakespeare's greatest writings on power in all its forms -- in love, in war, in politics and in the family. From Macbeth's vaulting ambition to Richard II's fragile grip on authority, from the violent rivalries of King Lear to the exquisite poetry of the love sonnets, these pieces show, with philosophical subtlety and psychological acuity, how we manipulate and dominate each other. Throughout history, some books have changed the world. They have transformed the way we see ourselves -- and each other. They have inspired debate, dissent, war and revolution. They have enlightened, outraged, provoked and comforted. They have enriched lives -- and destroyed them. Now Penguin brings you the works of the great thinkers, pioneers, radicals and visionaries whose ideas shook civilization and helped make us who we are.